On March 27, 2019, Tetra Tech sponsored an Engineering News-Record (ENR) webinar focused on how AEC professionals are helping building owners prepare for extreme weather events. “Resilient Building Design Strategies for a Changing World” discussed how the industry is transitioning to more resilient building materials, systems, and designs and ensuring critical systems maintain functionality when disaster strikes. As conceptual frameworks, resilience and sustainability increasingly guide decisions in the planning, design, and engineering of building projects. Resiliency emphasizes robustness and the ability to recover, while sustainability considers measures of environmental impact and resource conservation. Both concepts share common end goals in contributing to society’s capacity to thrive in a meaningful way. 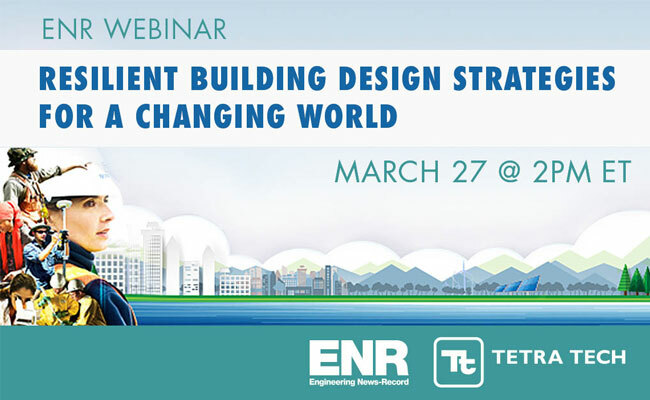 View the “Resilient Building Design Strategies for a Changing World” webinar to learn more about how buildings are being adapted to a range of changing conditions. Learn how Tetra Tech’s growing, global high performance buildings practice is using innovative design approaches to control temperature, reduce energy costs, and conserve water.